I can say the pain is a tad bit easier. Although it’s pretty sore first thing in the morning and worst at night. Lying awake staring at the ceiling listening to traffic go past isn’t much fun. But I am getting more movement in my wrist. Not too sure if there was initial damage there. Something I’ll have to ask the fracture clinic, as I’ve noticed more and more pain in my lower wrist where it struck the floor. Turning my arm upwards is pretty much still impossible. I get this cracking pop and it hurts, so I’m only doing so many in the day. For me, personal things are the worst. Still can’t put on underware. I’m in hubby’s T-shirts as they’re easier to get on, and bathing… sheesh not a chance. Can get in the bath, but not out. I’m like a decrepid old woman. And I feel it too. I don’t mind showers, but when you’re feeling crappy it’s nice to have a bath. Not at present. I’m finding it difficult in the ‘hobby’ side of things too. Not being able to write/edit as much as I’d like has to be a writers worst nightmare. Normally if I can’t write, I do something else creative. But my ‘other’ hobbies are out the window too. 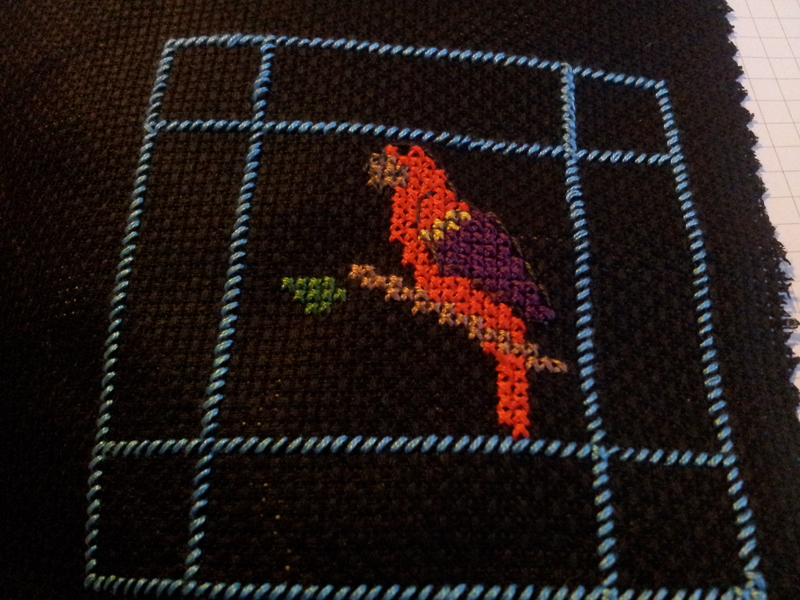 Normally I can cross stitch for hours, and have been putting some things for a charity I support. Here are a couple of pictures of my stitching for them. In the hopes it will help raise funds to keep unwanted/abused birds in the veterinary treatment they need. Unfinished but hope it will make a nice pin cushion 🙂 When I can stitch again. Just frustrating when you can’t do anything !! Uggghhh, here’s my lil Bobby though, he’s been great company while I’ve been home. Getting cheekier by the day though. At present I’m trying to get him used to being touched. Sometimes I get to feel his tail and place my finger on his back, but he’s not keen and flies away. 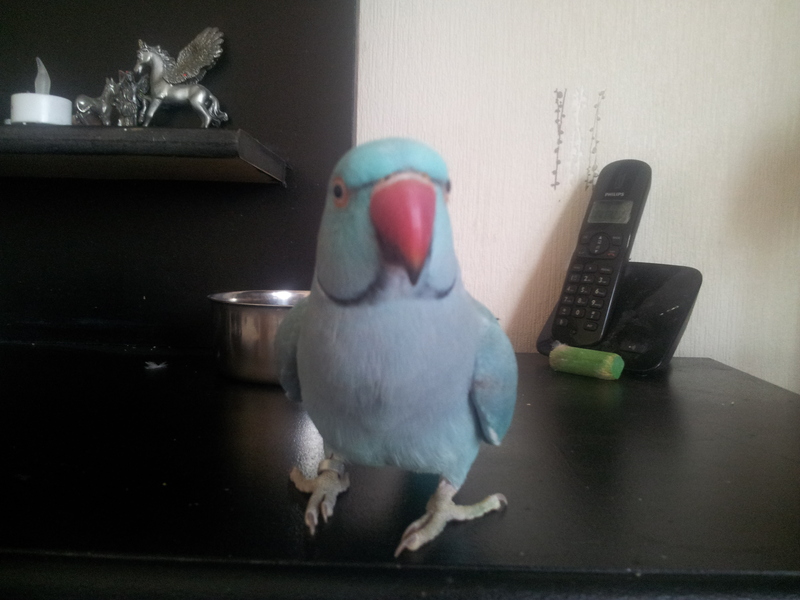 I am starting to be able to get near his beak without him biting. Although this morning proved he still has the upper hand when instead of going for the treat, he bit my finger instead, sometimes cranky when he first wakes up. This has taken me all morning to put together, so I’d better wrap it up. Catch you soon. Hope you have a wonderful week. Bear up best you can. I guess it’s like that sometimes. Hi Dawn – I hope you heal fast. I always find being incapacitated is a good time to dream up new plots, especially if I take powerful pain medication ; ) And thank you for liking my first blog post. It’s really easy hun, tiny little squares, and a pattern to follow 🙂 It’s really relaxing, (when I can do it) Hope you are well hun, don’t see your blogs much? or perhaps they’re snowed in with the others I follow. Haven’t been able to blog much. I’m working on that!